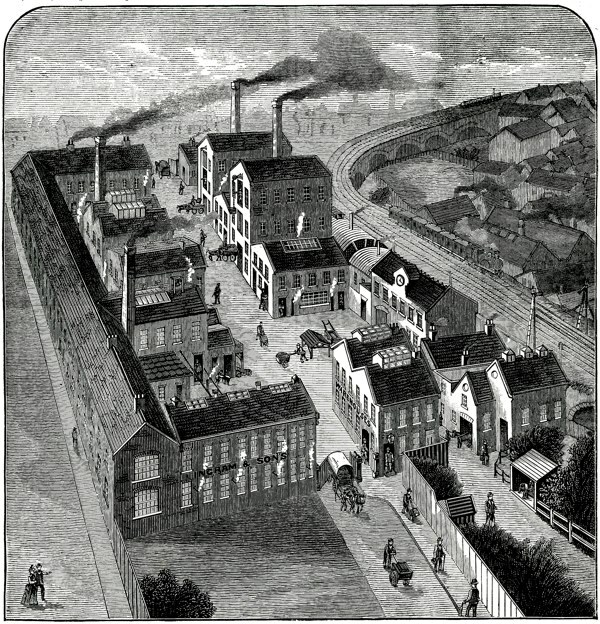 J G Ingram & Son, The London India Rubber Works, Hackney Wick - The business dates back in its foundation over forty years and was established originally by Mr Ingram in Hoxton, before – owing to its rapid development and the necessity for increased accommodation – the present factory was built fifteen years ago. 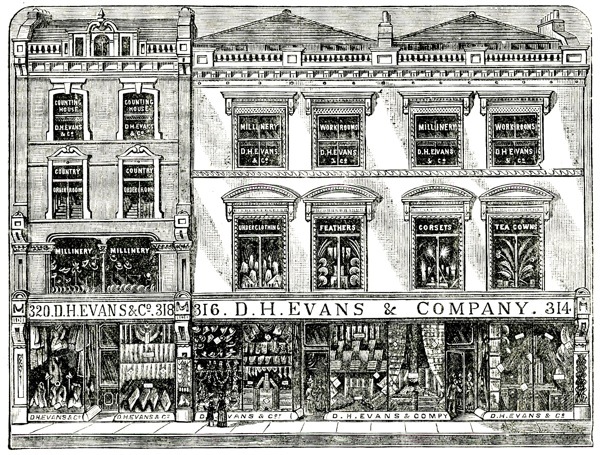 D H Evans & Co, Silk Mercers, Drapers & Outfitters, Oxford St - Within a comparatively short period of time, this notable concern has developed, through the energy and perseverance of its proprietary, from one shop of average size to one of the largest drapery establishments in London. 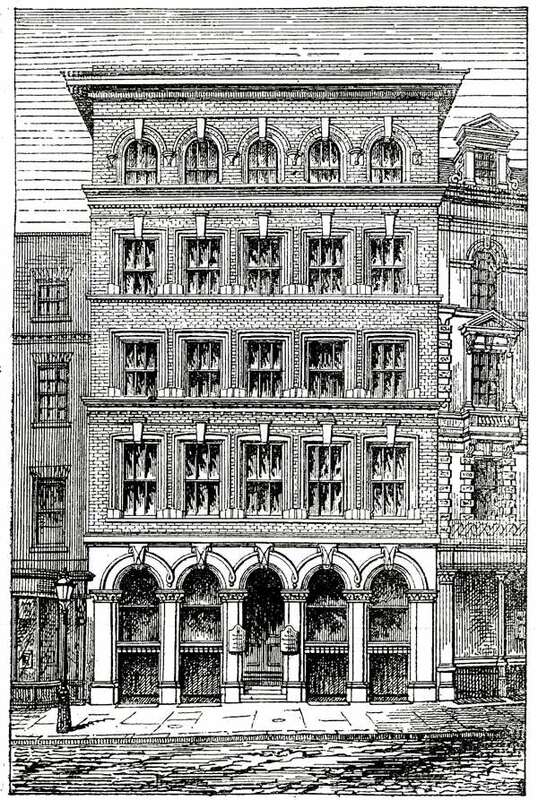 John Ward, Patentee & Inventor of Invalid Chairs, Carriages etc, Tottenham Court Rd -This notable business was formed upwards of a century and a half ago. 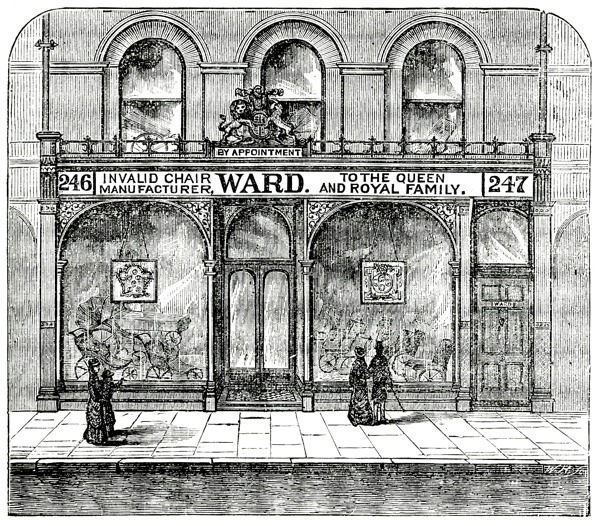 Mr Ward is engaged in this very scientific industry upon a very extensive scale and his productions for the relief of the invalid are esteemed all over the world. 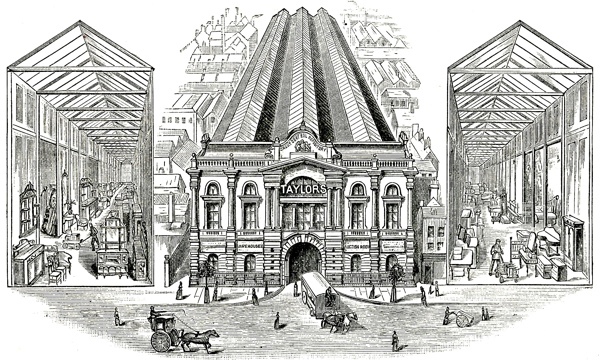 Charles Taylor, The Depository, Southwark, Opposite The Elephant & Castle – There are very few business establishments whose names are more familiar to the general public of London than the name of The Depository, as a monument to Mr Taylor’s vigorous ability and progressive spirit. 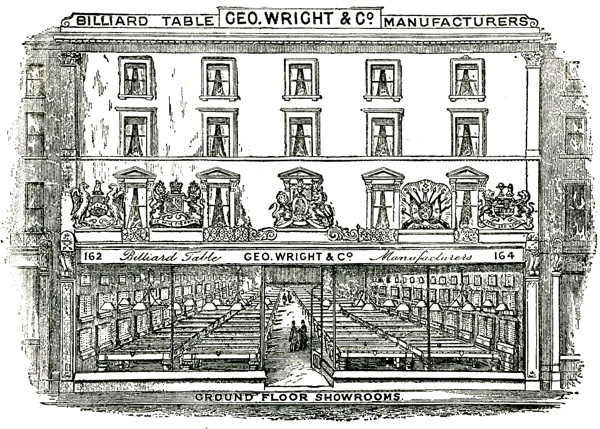 George Wright & Co, Billiard Table Manufacturers, Westminster Bridge Rd – During the time it has been in existence, this notable firm has led the way in inventions and improvements, thereby extending and improving the popularity of the game of billiards as a universal pastime for gentlemen. 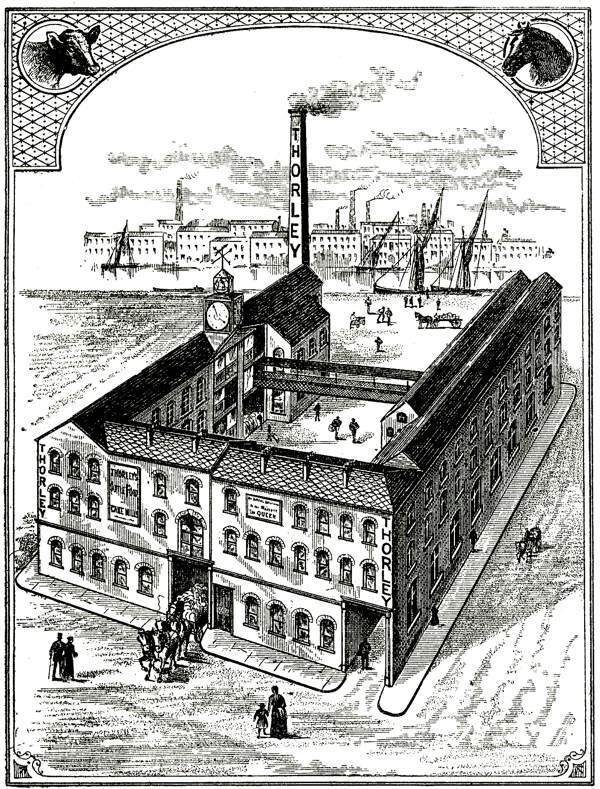 Whittard, Crisp & Co, Leather & Hide Factory, Market St, Bermondsey - This is a house that occupies a very prominent position in the factoring trade of Bermondsey, and its name and commercial principles are well known and highly esteemed by a widespread circle of valuable connections. 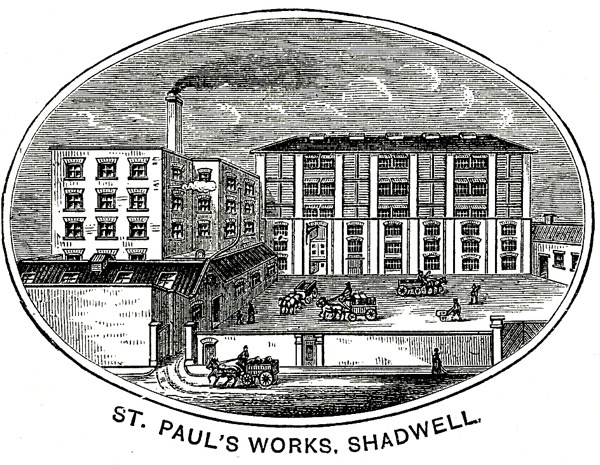 Thorley & Co, Cattle Food Manufacturers, Caledonian Rd, Kings Cross – Thorley’s Cattle Food is the first production of its kind to achieve a recognised position among agriculturalists and must be regarded as one of the great discoveries of a period that has been particularly prolific in great inventions. P B Cow & Co, Patentees & Manufacturers of India Rubber & Waterproof Fabrics, Cheapside – It is now about forty years since Mr Peter Brusey Cow succeeded Mr Mackintosh, the inventor of the remarkable waterproof garment, in the control of this gigantic commercial concern. 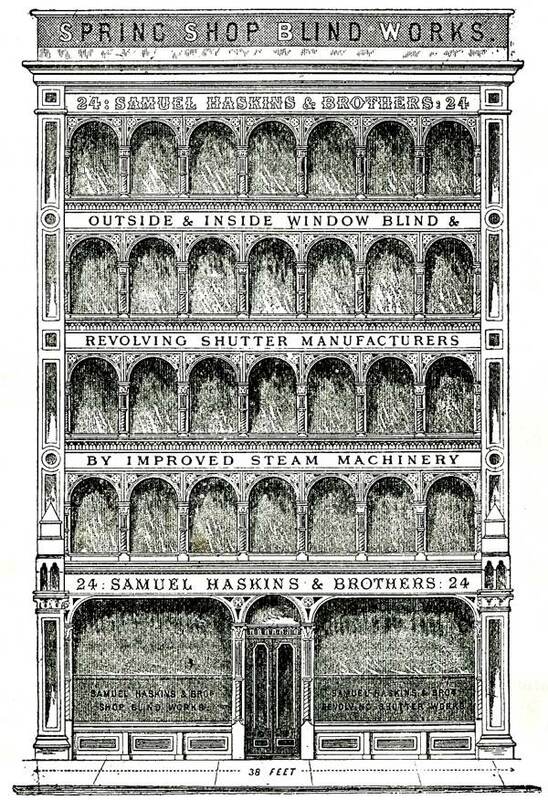 W Walker & Sons, Cabinet Manufacturers, Bunhill Row - The history of the firm dates back to 1848 when the concern was founded by Mr W Walker and during the whole of the forty years that has elapsed since then the growth of the business has been continuous. A visit to their superb showrooms in Bunhill Row will reveal the very acme of artistic achievement in this branch of the industry. 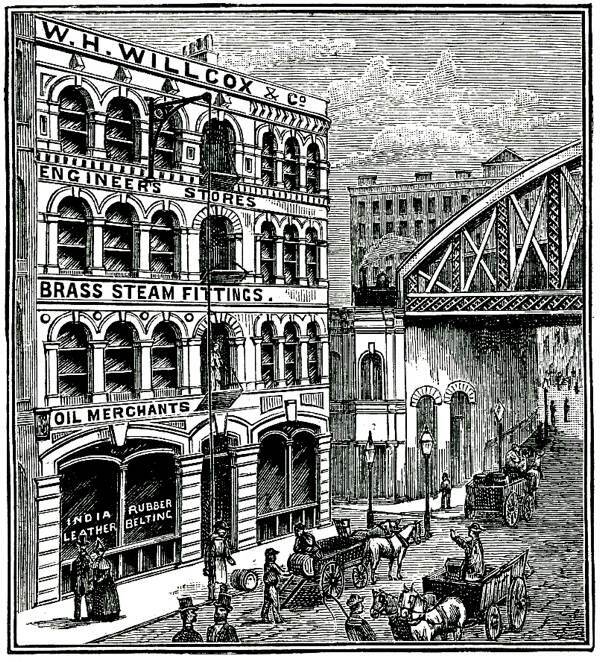 W H Willcox & Co, Manufacturers & Merchants in Engineers’, Mill & Railway Furnishings & Supplies, Southwark St - Founded fifteen years ago by Walter Henry Willcox, the firm are in a position to supply everything in the way of engineers’ requisites – from a bolt to a steam engine. 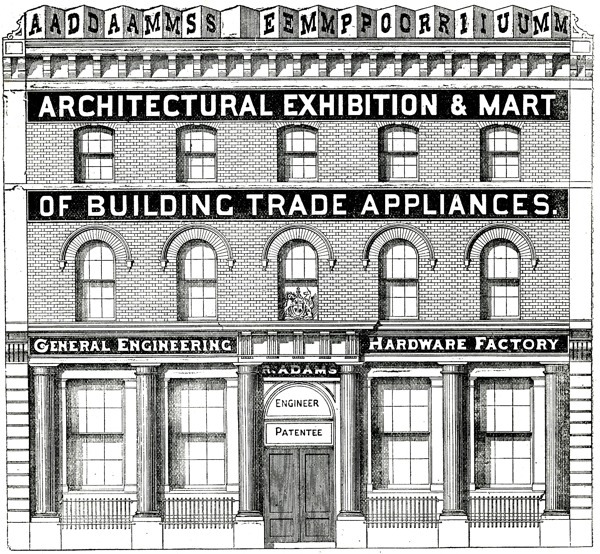 Robert Adams, Patentee, Manufacturer & Specialist in Improved Builders’ Ironmongery & Building Appliances, Newington Causeway - The business in question was established in 1870 and has acquired the most eminent reputation in the special departments of mechanical industry and hardware supply to which its undertakings apertain. 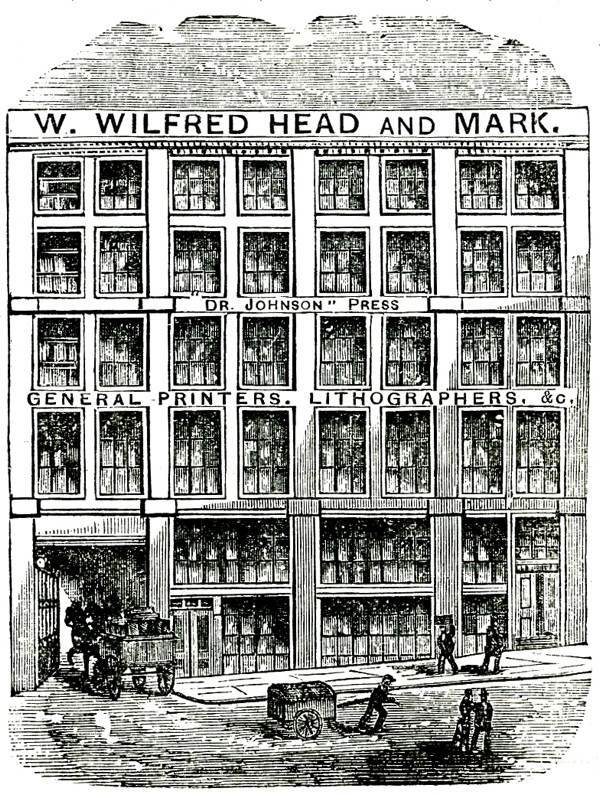 W Wilfred Head & Mark, News & General Printers, Lithographers & Engravers, Fleet Lane, Old Bailey - This eminent firm was founded upward of a quarter of a century ago and carried on business in Johnson’s Court, Fleet St, taking the name ‘Dr Johnson Press’ which it still retains and under which it is widely known in the printing world. 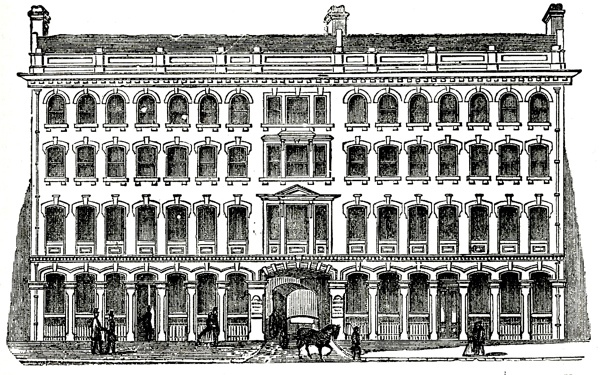 Avern, Sons & Barris, Cork Merchants & Manufacturers, Minories – One of the principal house engaged in the great London Cork Trade, their corks obtained a medal in Paris in 1878 and find favour with bottlers all over the world. 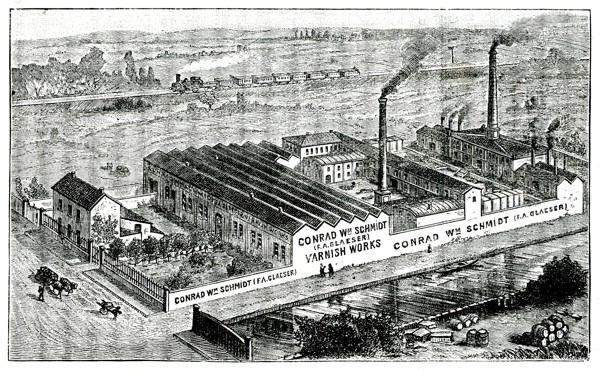 Conrad W Schmidt, Varnish Manufacturer, Carpenters Rd, Stratford – There is probably no larger firm of varnish manufacturers in the United Kingdom or, for that matter, anywhere than that of Mr Conrad W Schmidt. 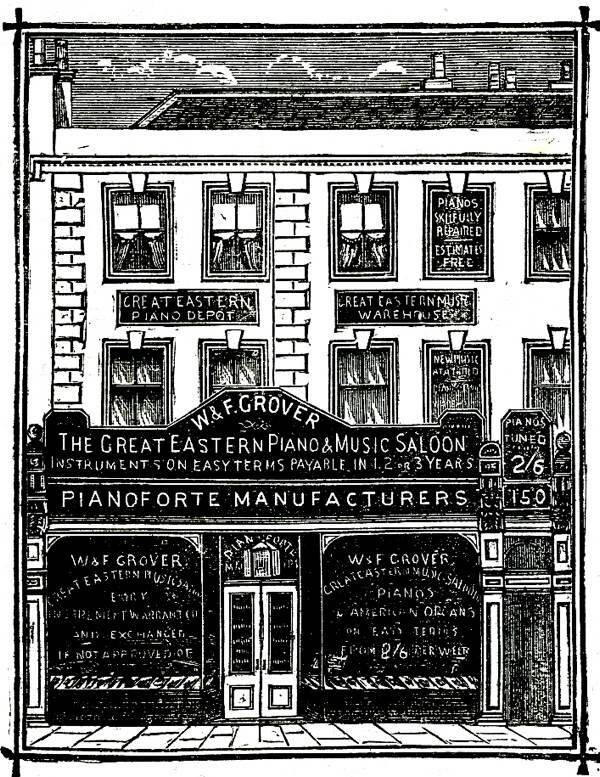 Grovers & Rockley, Musical Instrument Warehouse, The Grove, Stratford - This is the only establishment in the East End that embraces all departments in connection with the musical instrument trade. 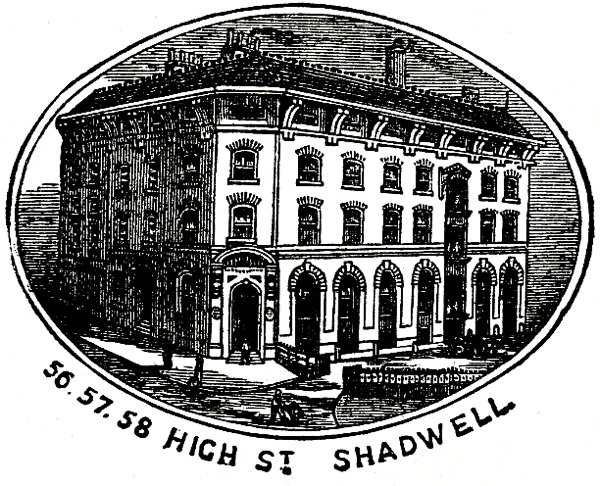 It was founded in the Kingsland Rd many years ago and was long since removed to its present location. 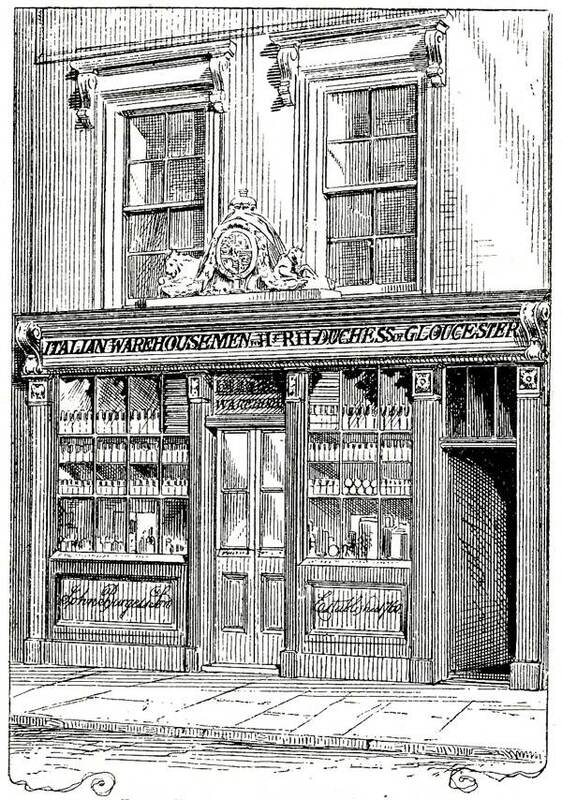 John Burgess & Son, Italian Warehousemen, Strand - Nowhere in London is the art of conservation, as practically applied to the preserving of certain classes of comestibles, more perfectly exemplified in some of its higher forms than at this famous old establishment at the corner of Savoy Steps. 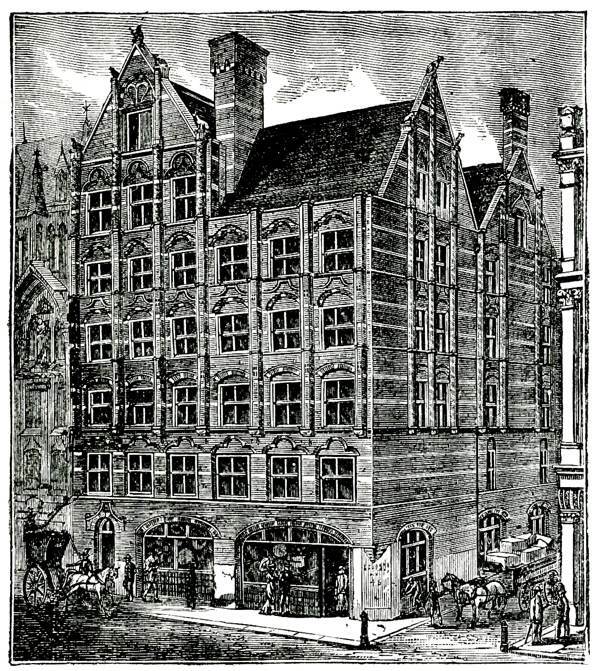 Samuel Haskins & Brothers, Engineers, Manufacturers of Shop Fronts, Revolving Shutters Etc, Old St - This eminently reputed house originated in the year 1784 under the auspices of the grandfather of the present principals and has been conducted uninterrupted from that day to this by members of its founder’s family. 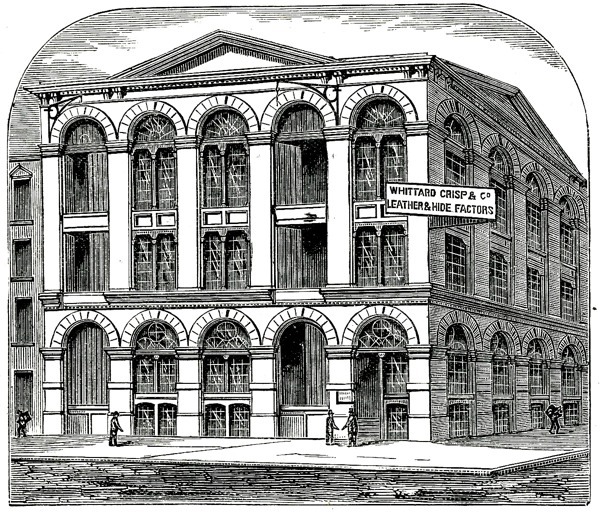 S E Norris & Co, Curriers, Leather Merchants, Belting Manufacturers, Shadwell High St & St Paul’s Works – This notable concern is one of the oldest in the trade and first came into especial prominence as far back as 1775, and, in the character and quality of their curried leather, this firm takes rank with the first in the kingdom. Some of the names are familiar- I guess from being mentioned by my parents many, many years ago. Makes you proud to be part of it all. Yes, all those manufacturing business’s would have been top employers in their localities. Some magnificent buildings. Delightful drawings. The industrial East End as depicted in these illustrations and yesterday’s photographs, reminds me of the North West, not the housing but the factories. The recent adaptation of Danny Baker’s autobiography on telly, looked to me like it was shot in the North West Of England but I guess in many ways it was a good substitute for the East End of the 70s before gentrification and 80s new builds.